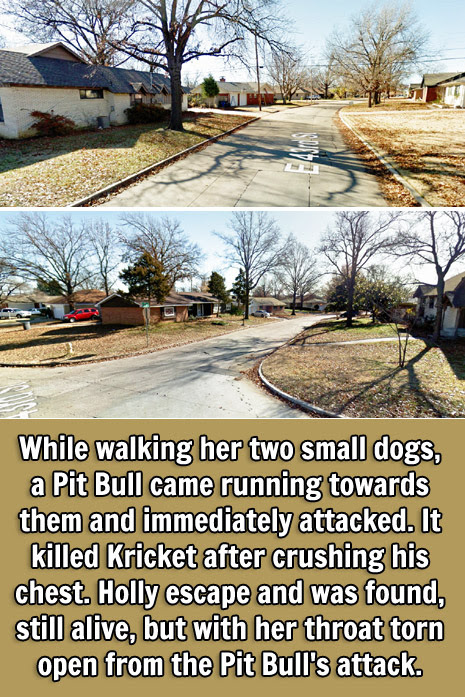 OKLAHOMA -- A Tulsa woman walking her dogs faces a vicious pit bull. The city of Bartlesville just passed an ordinance that is supposed to crack down on dangerous dogs. This recent attack in Tulsa has some wondering if Tulsa needs the same rules. News on 6 anchor Scott Thompson says it happened Friday morning. 73-year-old Claudine Papen was walking her two dogs just blocks away from her home, when a pit bull came out of nowhere and attacked her pets. Papen says the dog struck 3-year-old Holly first, and then attacked 2-year-old Kricket. Holly was able to escape. A Good Samaritan held back the pit bull so Papen could take Kricket to a veterinarian. The doctor who treated Kricket says the dog had 15 to 20 puncture wounds where the pit bull had sunk its teeth into the dog's chest. Kricket later died. Holly was found more than a mile away at LaFortune Park. Vets had to staple her throat shut and patch up her paws which she had worn down to the flesh. The pit bull's owner asked Papen if he could help. And he started to give me his name and phone number and I said, 'I know who you are.'"